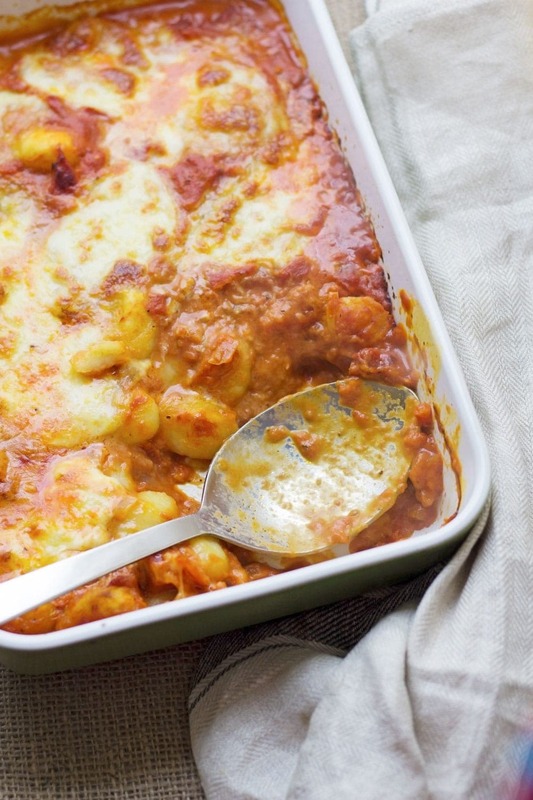 There is nothing more comforting than this cheesy baked gnocchi. 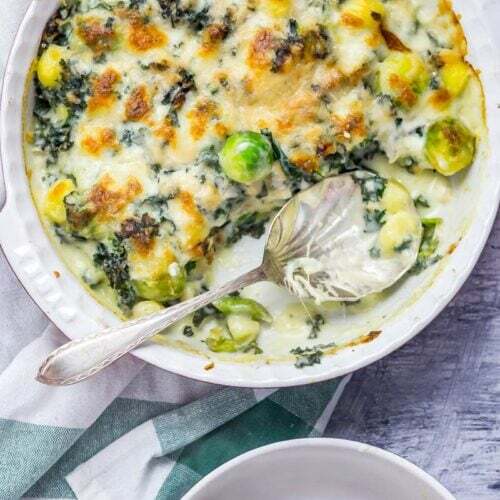 It’s bulked out with kale and Brussels sprouts for a satisfying dinner which is still pretty healthy! Baked gnocchi is excellent comfort food. We love it with plenty of added veggies because it makes for a filling dinner. And of course there’s plenty of cheese! I weirdly like kale. It’s one of those things I definitely should not like. I find vegetables to be pretty underwhelming on the whole but recently I’ve really gotten into kale. In this baked gnocchi some of the edges poke out the top and get all crispy and roasty which is just perfect and I’ve even been craving it in like a salad and stuff <—-whaaaaaat?! Kale works really well in cheesy, carby pasta type dishes like this. I guess maybe it’s just the perfect balance between the healthy and the unhealthy that I love so much. If you want more kale recipes then take a look here. 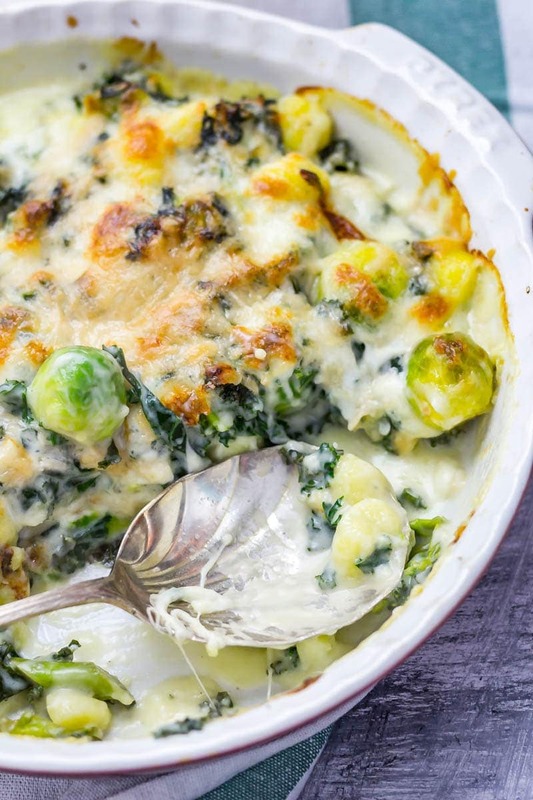 The other funky thing about this gnocchi bake? The other main ingredient (apart from gnocchi) is Brussel sprouts! Now I know they are a bit of a love hate thing for most people but trust me they are so good in this cheesy baked gnocchi! Then of course you’ve got your heavily cheesy top which goes all browned and slightly crispy. Oh man, just so good. Gnocchi, and in particular baked gnocchi, is something I crave on the regs. Unfortunately Will isn’t much of a fan of gnocchi (I know, I know). When Will says he doesn’t like something which I happen to love I tend to think one of two things. Either I just think he is downright crazy and wait until nights when he’s out so that I can make it. Or I assume that whenever he’s had it in the past he just hasn’t had it the right way. Of course if that’s the case then I am obviously going to keep feeding it to him until he likes it because we must like all the same things. This strategy has proven pretty successful in the past with things like aubergine (eggplant) so I’m confident that I’ll eventually succeed with gnocchi too. I’m pretty sure that baked gnocchi is the way to go. 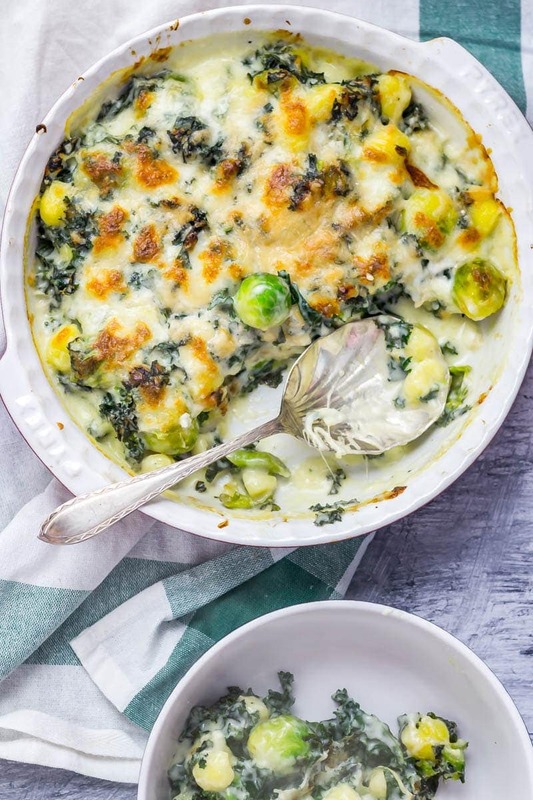 I actually first made this just before Christmas and somehow other recipes have kept seeming more important to share so I’m glad this baked gnocchi is finally having its moment to shine. Shine little gnocchi, shine! 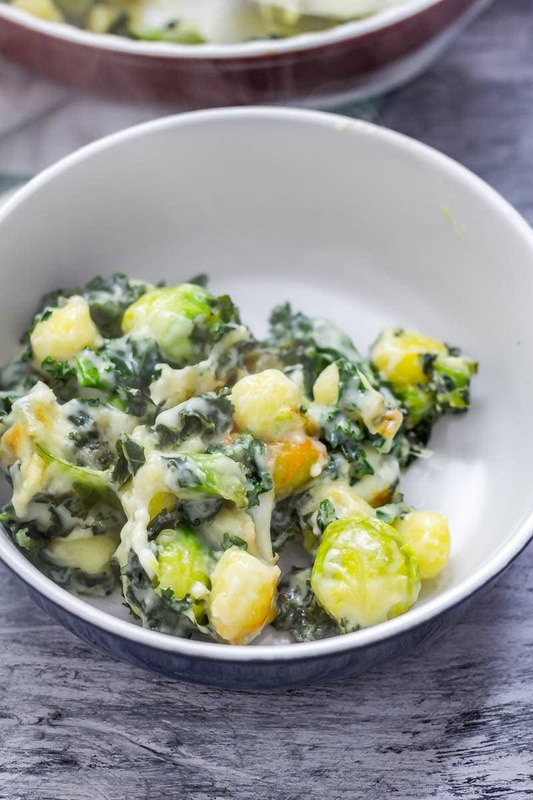 Oh and if I haven’t convinced you to try this recipe with kale and Brussels sprouts then definitely 100% make it and just throw in some other veg. Spinach would be splendid, broccoli would be bonkers, spring greens would be super…you get the idea. If you love a good baked gnocchi dish try out my other favourite too, this cheese and tomato baked gnocchi, it’s cheesy, tomatoey goodness. Perfect for a weeknight family dinner that kids and adults will both love. 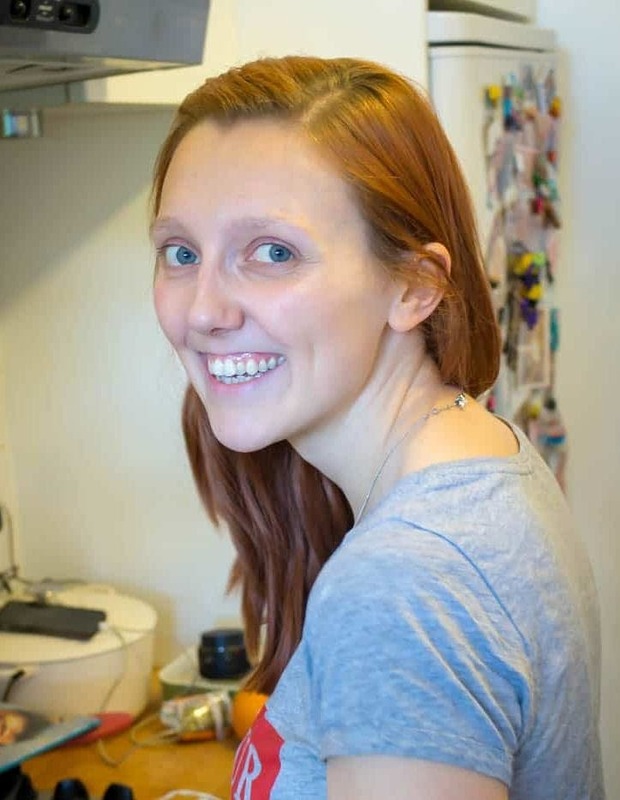 Love a good vegetarian recipe? Me too! Find all my faves right here. 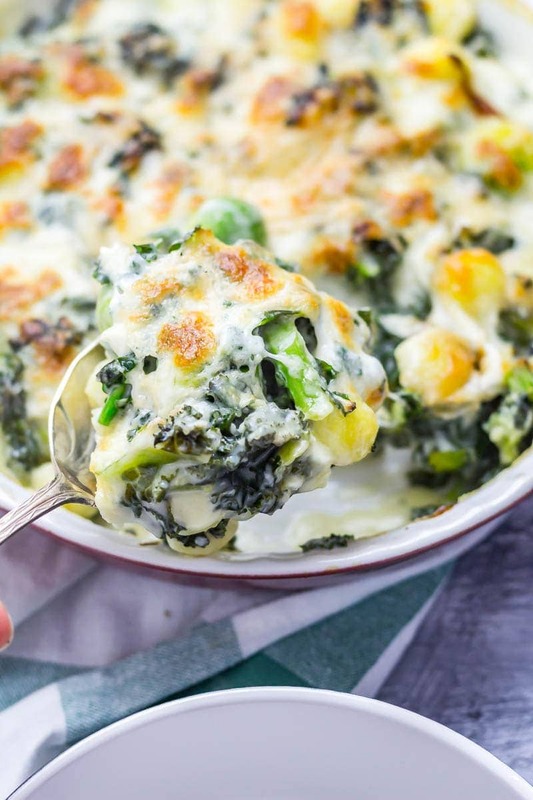 WONDERING WHAT TO DO WITH THE LEFTOVER INGREDIENTS YOU’VE GOT FROM MAKING THIS CHEESY BAKED GNOCCHI WITH KALE & BRUSSELS SPROUTS? 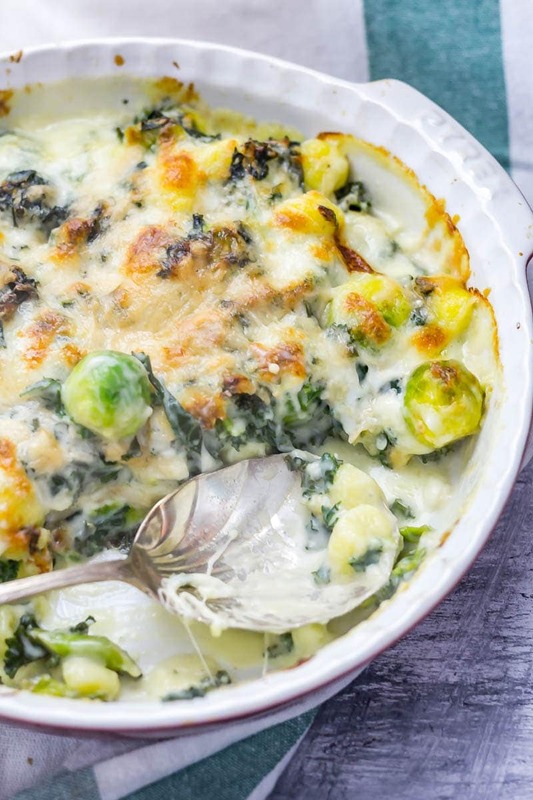 There is nothing more comforting than this cheesy baked gnocchi. 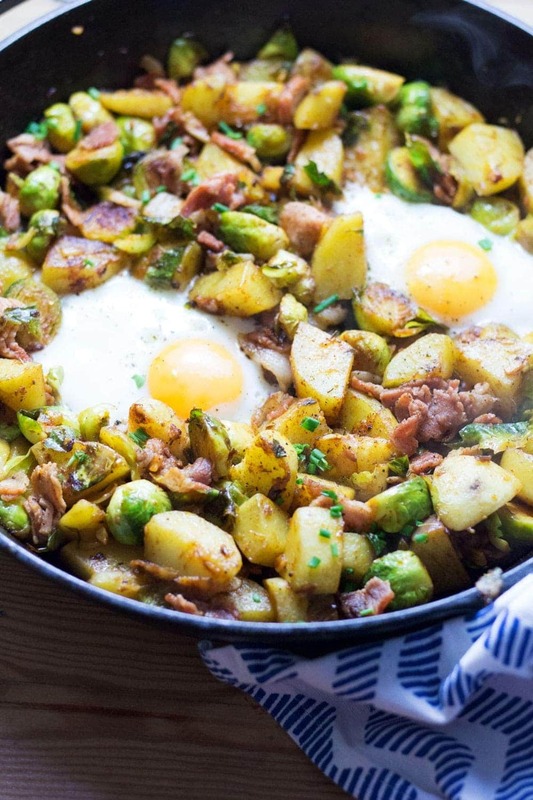 It's bulked out with kale and Brussels sprouts for a satisfying dinner which is still pretty healthy! Preheat the oven to 200°C. Bring a large pot of salted water to the boil. Add the sprouts and boil for 5 minutes. Add the gnocchi and kale and cook for another minute. 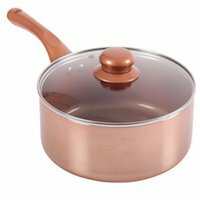 Drain and return to the pan. Meanwhile add the butter to another saucepan over a medium heat. Once melted add the garlic and cook for 2 minutes. Stir in the flour followed by the milk and salt and pepper to taste. Whisk to get rid of any lumps then bring to the boil and cook until thickened. Turn off the heat and add the cheddar, stir through until melted. Pour the cheese sauce over the gnocchi and vegetables, stir through. Tip into a baking dish and tear over the mozzarella followed by the grated parmesan. Bake in the oven for 20 minutes. Stuffed Crust Pizza with Chipotle Chicken What's in Season in February? Food to Brighten Your Day! My husband isn’t a big fan of gnocchi either – they should invent an emoji that both rolls his eyes and cries a little bit at the same time to represent how I feel haha. But anyways, this bake sounds absolutely wonderful!! Two things I absolutely love; gnocchi and brussel sprouts. This looks soo good! WHOA. 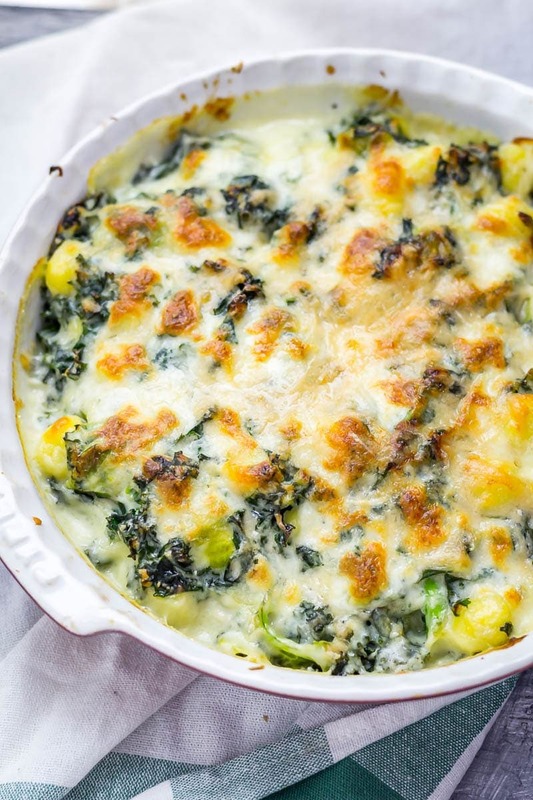 This is like all of my favorite things–lots of cheese, gnocchi, and greens! Can’t wait to give it a try. Oh wow! I was sold by the time I finished reading the word ‘cheesy’ but having looked at these pictures I’m now super hungry! Definitely, one to make soon!